The Order of Saint Michael is an esoteric, ecumenical Christian community oriented toward self-knowledge (gnosis in its original meaning) and spiritual growth. The Order provides	a community for those seeking to enrich their traditional faith experiences and for those	searching for a personal path to the Divine. Members seek contemporary meaning in traditional	forms of worship and prayer, combining the rich traditions of the past with an exploration of contemporary mysticism and ritual. We are a 21st century order, widely scattered geographically all over the USA, with several members in Europe as well. We are linked together by the Internet, and are learning to use the power of this new resource to create new ways to live the religious life in community. The Order offers those living in the world an opportunity to experience the support of a like-minded community in developing a personal, esoterically-oriented spiritual life without necessitating a break with family or worldly ties. We are non-dogmatic, professing no specific creed. The Order is not intended as a substitute for an individual's affiliation with any institutional church or denomination, but as an adjunct to, and enrichment of, his or her understanding of Deity. (Some members are clergy in their own traditions.) We are men and women, clergy and laity, married and single from many traditions. We believe in the equality and dignity of all human beings without regard to race, gender, sexual orientation, cultural or religious background. Members of the Order come from a variety of professions. Among others, we are writers, artists, teachers, scientists, computer programmers and technicians, lawyers, medical professionals and clergy. We discuss anything and everything - with respect for the differing views of all of our members. We take our quest for the Divine with the utmost seriousness while believing that it can be joyous and even fun along the way. Many of us enjoy science fiction and esoteric conventions. Some members recreate the past in the Society for Creative Anachronism and Civil War reenacting. We have members who are musicians and Morris dancers, scholars of church history and Celtic traditions, craftsmen and women who embroider, make vestments and construct fabric art. These are only some of our interests. We all seek the Light. Members aspire to the traditional Benedictine vows of STABILITY, seen as a personal commitment to the path the individual has chosen to follow, CONVERSION OF LIFE, which is the constant turning of the individual to God, and OBEDIENCE, from the Latin root audire, to hear, which means to listen and hear with the ears of the heart and to respond eagerly to the will of God as it becomes known in one's daily life. The Order of Saint Michael recognizes the central value of shared community worship and other common devotions performed in unity of spirit and intention, even when separated by time and space. The Order is both liturgical and mystical in worship and prayer. We regard the Eucharist as Jesus Christ's supreme gift to us. Clergy in the Order celebrate a form of traditional high church Eucharistic service, offering Holy Communion to all who are prompted by the Spirit to seek connection with the Light. The Order also regards the traditional offices of morning and evening prayer as a particularly effective means of daily communion with God. Members are encouraged to pray these offices both in community and individually. In community the Order seeks connection with the Divine through guided meditation, Taize services, walking the Labyrinth, building the Inner Temple, and other rituals both ancient and modern. Individual meditation is greatly encouraged in daily life. Within a Christian, Trinitarian framework, the Order recognizes both the masculine and feminine attributes of Deity, and the Order's liturgies and devotions seek to reflect this balance. The Holy Spirit may be addressed in certain contexts as the Paraclete or Comforter, the Holy Sophia or Divine Wisdom, and the Ruach that brooded upon the face of the waters in the beginning and brought forth life. Although we pray within a Trinitarian, Christian framework, all who seek the Light are welcome to participate according to their conscience and the inspiration of the Spirit. We believe that every man and woman must be free to seek the most appropriate individual expression of his or her relationship with the Divine, and we hold the greatest respect for intellectual liberty and individual conscience. The patron saint of the Order is the holy Archangel Michael who, as Captain of the Hosts of Heaven, embodies the ideals of chivalry and service to the Light. In addition, the Order holds a particular devotion to Our Lady, in all her guises, and commends its members to her special protection and favor. There are three categories of general membership within the Order - Regular, Novice and Associate. Within the general membership there are special interest groups for those who are called to concentrate on healing within a Christian framework (Hospitallers), on following the chivalric ideal in modern life (Company of St. Michael), and on exploring the esoteric life (Esoteric Study Group). Regular: Regular members vow to follow the Rule to the best of their ability, to pray and meditate daily. Vows are usually taken for a year and a day. Novice: Novice members promise to undertake a trial of the Rule, for a year and a day, promising to pray and meditate on a regular basis, but not necessarily daily. Associates: Associate members, who are from many different traditions, including non-Christian but compatible spiritual traditions, agree with the aims and ideals of the Order, but, for spiritual or personal reasons, choose not to follow the full Rule. These members participate in as much of the worship, prayer and work of the Order as seems fitting to them. Members communicate and support each other in their spiritual quests by several means. The Order maintains an electronic subscription list so members can communicate daily, bringing their ideas, questions, concerns and prayer requests to the membership. The Order produces a quarterly Newsletter that contains news, minutes of meetings, spiritual essays and a prayer list. The Order also sponsors a yearly Retreat where members can meet in person for a weekend of prayer and discussion. Members of the Order who are close geographically may meet at other times for prayer and discussion. Members also have gatherings at ecumenical, esoteric and science fiction conventions they happen to attend. Please include a postal address to assist in referring you to members in your region. The Order is a voluntary association. Membership may be ended at any time. 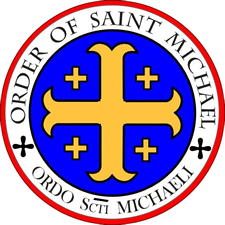 The Order is not connected to any other organization or group that may use the name St. Michael.